Picture a Day - The Holy Land Revealed: A Mystery Photograph from "Palestine" -- Can Anyone Identify this Ship? A Mystery Photograph from "Palestine"
-- Can Anyone Identify this Ship? The mystery ship. The back of the picture only says "Palestine" and "WX25115"
The picture above appears in the University of California - Riverside's Museum of Photography. No details are provided other than the word on the back, "Palestine." Every man is wearing a western style cap or hat. 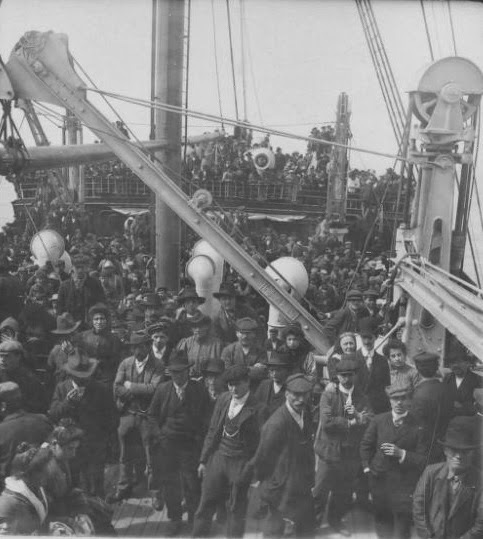 There appear to be no religious Jews on board, men vastly outnumber the few women in the photo, there are no suitcases or identifying clues other than a German language sign "Tragkraft" on the crane that translates "Lifting capacity 3,000 kilo." We estimate the picture to have been taken early in the 20th century. I would go by the years if the style of men's clothing. Most are wearing cloth caps, what Americans might call golf caps. The men's clothing to me seems to be from about 1910 to 1930. Are you sure that the boat is going to "palestine"?? Could the word "palestine" refer to something other than the country then called "palestine" in the West?